Get ready for a New Year calorie blasting week! Training over 5 consecutive mornings, you'll get a full body workout, combining strength, cardio, endurance, core and functional movement. You'll scorch calories and be challenged from head to toe. It'll be fast, furious, and fun all at the same time. Book now for an early bird discount! But it’s January and I'm not feeling very fit? You'll be introduced to all of our BootCampers on the first day. We'll then work hard to ensure an inclusive, motivating spirit and strong sense of comradeship during the week. Head over to our BootCamp page to book or contact us for more info. As we've done over the past few years, we're moving into the Holy Trinity School Hall on Monday nights starting from 29th October. We'll be training there every Monday night until the Spring. Unfortunately, due to hall availability, we will have to move this class to the later time of 8.00pm. We can really appreciate that some of you will be happy with the later time, whilst others will find it more challenging to join us. We're really sorry for any inconvenience. We do promise a really fun session though, so do come and give it a go! It's summer holiday time! If you're not going away over the next couple of weeks, make sure you join us in the park. We've got a full timetable for you, with only a couple of changes to our Wimbledon Park early sessions (see below). All mums are welcome to our Buggyfit classes over the summer, including those with older children. Your little or big ones are welcome to play/sleep/eat/read nearby whilst you train (as always, your children remain your responsibility). Head over to our timetable for all the details. If our daytime sessions don't work for you, why not join us at 6.15am? You can choose to finish at either 7.00am or 7.15am. When it's warm, there's no better time to exercise than in the cool early in the morning. Before work. Before the rest of the family are up. Before you've managed to think up all those excuses not to do it! Here's the plan for Wimbledon Park early classes over the next couple of weeks. We hope to see lots of you there tomorrow morning! Come into the park via the Revelstoke Road entrance & you'll see us. All of our other Fit In The Park & Buggyfit sessions will be going ahead as normal over the next few weeks. You can buy your pass online & then pick it up at your next class. Don't forget to apply suncream & squirt some bug spray on (especially for our early morning & evening sessions). The All England Tennis Club might call the shots when it comes to big international tennis names, famous courts and legendary matches, but Wimbledon also has an abundance of smaller clubs for the non-pros and more casual SW19 players. No matter what your tennis ability is though, if you want to improve your game, you should do what the Centre Court Champions do, and train off-court. For a winning combination of fast serves and powerful volleys, you need a strong upper body and good core stability. Medicine balls, kettle bells and battle ropes will all help with this. Use big moves that require large ranges of motion and make demands on your whole body. Build up endurance in your legs with body weight exercises like split jumps, squat jumps and box jumps. Include lots of multi-directional moves that involve leaping and hopping sideways, forwards & backwards. Tennis requires brief bursts of intense effort. To be fast on the court, practice short sprints with quick changes in direction. The fitter you are, the quicker you’ll recover after pushing hard. Include some HIIT (High Intensity Interval Training) into your week and you’ll be less like to gasp for air in between points. Off-court training allows you to focus on your footwork technique, without having to worry about hitting a ball. Set-up some drills using agility ladders and cones. Test yourself on both your speed and accuracy. Try and improve one, without detrimentally affecting the other. It’s not as easy as it sounds! To reach those really challenging shots, you need a certain degree of flexibility. A good yoga or stretch class will help you to loosen up those tight bits and give you a greater range of motion, particularly in your hips and shoulders. Taking time out each week to improve your flexibility, will not only boost your game, but will reduce your risk of injury and may help you to unwind a little too. Vary your workouts to keep your mind motivated and your body challenged. Off-court training can be lots of fun, and you might be pleasantly surprised how it can really transform your game. HA fitness runs a wide range of outdoor classes that incorporate all of the above! Check out our timetable for more details. Or why not get in touch to book some one-to-one personal training sessions with us. 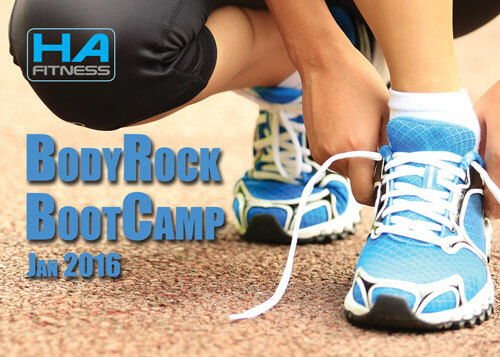 Kick-off your New Year's resolutions at our new-style BodyRock BootCamp in January. Training over 5 consecutive mornings, you'll get a full body workout, combining strength, cardio, endurance, core & functional movement. We'll bring a variety of different kit along to keep it fun, help you scorch calories & challenge you up from head to toe. Early Bird Discount! £40 for each 5-day Bootcamp if booked before 22 December 2015 (regular price £45). Don't forget that tonight's Fit In The Park will be at the Holy Trinity School Hall between 7.30 - 8.30pm. Situated on Effra Road, the school is just a 2 minute walk from South Park Gardens. Come into the school via the French windows at the front of the building. There is free parking on the road outside the school (but do check the restrictions). There are clean toilets, a drinking fountain and it's mud-free! Train Like an Ancient Persian Warrior! Some bounce, some have handles and some have ropes attached to them. Modern medicine balls now come in an amazing array of sizes, colours and weights. However, the original prototypes (produced some 3000 years ago) were not so attractive. Made out of animal bladders and stuffed with sand, they’re thought to have been used in training by Persian warriors, Hippocrates, and ancient Chinese martial arts masters, to name but a few. So why are they called medicine balls? Moving forward into the 19th century, ball training became a popular workout feature in the gymnasiums. At this time, the words “health” and “medicine” were synonymous, and the term “medicine ball” is believed to originate from this period. More recently, hi-tech gadgets and complex machines have taken over in our gyms. However, the humble medicine ball is now making a come back, as the benefits of functional training are seen as being increasingly important. Medicine ball training is really adaptable and can be used for beginners, weekend warriors and endurance athletes alike. Using a few differently weighted balls, you can beef-up circuit training sessions and traditional exercises to create tough, stamina-building workouts. It's a really efficient way to develop your speed, strength, balance, and endurance. They're also perfect for beginners and are a fun tool for those wanting just to get into shape and vary their workouts. Medicine ball training uses your muscles in a similar way to when you're lifting objects in everyday life (eg children, shopping etc) so it is much more practical than using dumbbells. Medicine balls can also be a really efficient form of sports specific training. With a bit of imagination, they can be used to simulate and help improve golf and tennis swings, swimming strokes, and football and basketball techniques. Runners can also train with the ball to push their core rotational muscles. You can work your whole body or just target specific areas, and they're an ideal tool for improving your core power and stability. Practically everything you do with a medicine ball will work your core muscles to some extent. So whether you're lifting, throwing, squatting, crunching, pressing, or twisting with them, your abs should be fired-up too! Start-off with some lightweight balls and keep the movements slow whilst you focus on your technique. After a few training sessions, you can speed up the actions, but remember to maintain good control at all times. Make sure you get proper instruction on technique as even lightweight medicine balls can cause injury. So whether you're a beginner, seasoned exerciser needing some inspiration or training for the Tough Guy event, it's time you added some balls to your workouts! To get the most out of your ski trip, you should get your body into shape well before you hit the slopes. Ski-specific fitness training will help you to ski harder, faster, and injury-free. You'll also have more energy to party in the evening! You should focus on exercises that simulate the moves you'll be making on the slopes. For example, start to build-up your "crouch endurance" by getting into your ski tuck position and holding it for several minutes. Work your thighs by holding a squat position with your back flat against a wall. Build up the time you can endure in this position and/or hold weights in your hands to increase the intensity. Once you've mastered this, try lifting one heel up at at time, putting more weight on the other leg (similar to turning on the slopes). Try placing a skipping rope on the floor and jump sideways over it with your feet fairly close together (as if you had skis on). Start with several sets of 30 to 40 seconds and gradually add time on to increase your endurance. Up the intensity by doing this in a crouch position! A great way to work the whole body whilst also increasing your stamina and endurance for skiing is circuit training. The three key areas to focus on are cardiovascular fitness, lower body strength training and core stability. Perform 1 minute of each of the following exercises, then rest and move onto the next one. Each week, reduce your rest period until you just have enough time to sip some water in between exercises. Building up your endurance in this way will help you to recover quicker in between challenging ski runs. Always warm-up before you start, and finish with a cool down and stretches. Lunges (include some challenging variations such as skater lunges, lunges with knee lifts, lunges with back leg raised, walking lunges, half lunges etc). Calf-raises. Try doing these on a step and/or on one leg. Increase the intensity of any of the above by holding dumbbells. Holding the plank position to increase your core stability. Try different variations on this including plank walking, reverse planks, side planks etc. Aerobic endurance activities such as running, cycling and hill walking should also be included into your fitness plan. As with all of the above, you should try to increase the intensity and duration of these activities over the weeks leading up to your trip. If this has whetted your appetite and you fancy some ski-specific training, please give me a call on 07941 851 778 or email heather@hafitness.com. We can arrange to meet up for one-to-one sessions, partner training, or small group classes. Why not get your friends together for a pre-ski workout?